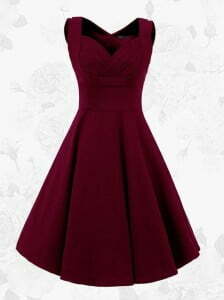 What is the color burgundy and what matching colors you can wear with it? This is a heady and deep shade, which does not give up its leading position in the ranking of fashionable winter and autumn colors about 5 last years. mustard yellow (to support brown in it and make the look warm and cozy). Burgundy is a color of French wine, ripe cherry and gorgeous expensive roses. You will hardly resist the magic of its matches. In order to get this shade you should mix red and brown in the right proportion. The amazing color combo — burgundy pants outfit with light blue button-up shirt. If you want to dare a little more, you can use it instead of black when it is required or just mix these two deep colors. If there is a desire to relax it and refuse its exceptional nature and kingliness, replace black with grey, off-white or even snow-white for a rich in contrast and really appealing look. The neutral hues pair perfectly with burgundy still underlying its elegancy against the calm background. What color goes with burgundy is least recommended? Perhaps you should be careful with the dark shades without adding any bright or light accents. Burgundy chiffon midi skirt with pendant and beige blouse. Romantic and cute image.